A geologist inspects the ground at a prospective Atlas Iron Limited iron ore mine site near Port Hedland, Australia (May 26, 2008 file photo). 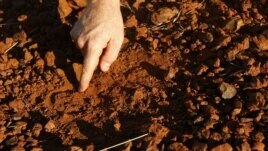 SYDNEY – Scientists at an international symposium in Australia say soil degradation is posing significant challenges for the future of humanity and the planet. The conference is examining the importance of soil security in fighting the effects of climate change and protecting food supplies in poorer countries.